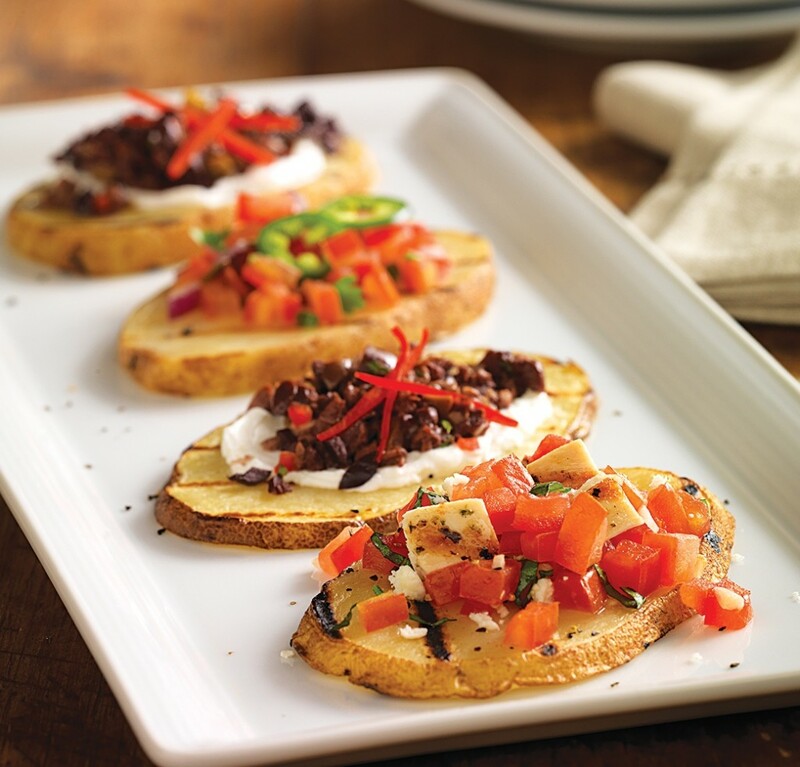 Grilled or baked russet potatoes topped with your favorite flavors—perfect for any festive party! Preheat grill or oven to 400°F. Thinly slice potatoes length wise to 1/4 inch thick, discarding ends. Place on grill or prepared baking sheet in single layer and cook for 10 minutes on each side. Top with your favorite toppings: Bruschetta: 2 medium tomatoes diced, 1/4 cup chopped fresh basil leaves, 2 cloves (1 teaspoon) of minced garlic and 1 tablespoon of olive oil. Toss together in a bowl and spoon on top of potatoes. Optional: Add chopped chicken to Bruschetta topping. Mediterranean: 1 (6 oz.) container of feta cheese, 1 (2.25 oz.) can sliced olives drained, 1 medium tomato diced (optional), salt and pepper to taste. Toss together in a bowl and spoon on top of potatoes. Creamy Greek Yogurt with Lemon and Herbs: 1/2 cup plain nonfat Greek yogurt, 2 tablespoons chopped fresh dill, juice of 1/2 lemon, salt and pepper to taste. Mix together in a bowl and spoon on top of potatoes. Garnish with dill sprigs. Baked Potato: 1/2 cup plain nonfat Greek yogurt, 1/4 cup shredded reduced-fat cheddar cheese, 2 tablespoons plus 1 tablespoon fresh chives chopped. Mix all ingredients except 1 tablespoon of chives in a bowl and spoon on top of potatoes. Garnish with remaining chives. Pico de Gallo: 1/2 cup pre-made Pico de Gallo or mix 1 medium tomato diced, 1 small onion finely chopped, 1 green onion chopped, 1/2 teaspoon minced garlic, 1 tablespoon chopped cilantro, salt and pepper to taste. Mix all ingredients in a bowl and spoon on top of potatoes.